A Scottish Highlands Coach Tour – Explore beyond Scotland’s tartan façade where there lies 8,000 years of history and a rich cultural heritage, while the drama and variety of her natural features never fail to impress. 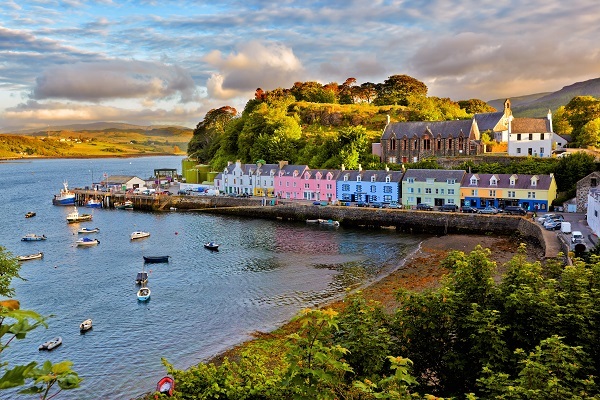 Explore the Northern Highlands and Isles of Orkney and Skye on the Country Roads of Scotland Tour which is well paced and offers two-night stays in both Edinburgh and Thurso. Tour feature: Maximum group size of 40. Tour Style - Comfortable. Landing in to Edinburgh Airport make your way in to the city to your centrally located hotel where you can leave your luggage or check-in by afternoon (complimentary airport transfers available, please ask for further information). The rest of the day is yours to relax or begin exploring some of this great city. Later join your Tour Director and fellow travellers for a Welcome Reception - a pleasant and relaxed evening of dinner and wine. On selected departures, you will also attend the spectacular Military Tattoo - a colourful mix of pipes and drums, dance and display, set against the floodlit backdrop of Edinburgh Castle. This morning we are joined by a Local Expert to assist us as we explore the many highlights of this beautiful city. We’ll drive along Princes Street passing the ornate Scott Memorial, then tour the 18th century New Town with its elegant avenues and classical Adam façades. Over in the medieval Old Town we climb the Royal Mile to visit the majestic Edinburgh Castle, home of Mons Meg, the Stone of Destiny and Scotland's crown jewels. We’ll also catch views of the Palace of Holyroodhouse, the official Scottish residence of the Queen. The remainder of the day is yours to spend at leisure, why not visit one of the city’s many galleries and museums or indulge in a spot of souvenir shopping. Bidding farewell to Edinburgh, we cross the Firth of Forth into the rolling hills of Fife; here we make our way to St. Andrews, where golf was born on the Old Course in the 15th century, to enjoy some free-time to explore. 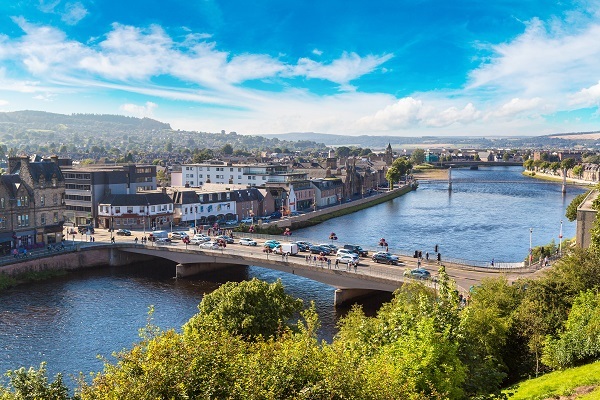 Then we cross the Tay and drive to the charming Victorian resort town of Pitlochry, famous for its salmon leap before crossing the Grampian Mountains to the sparkling Spey Valley. Here we stop at Ballindalloch Castle and Gardens, one of the only occupied castles in Scotland, inhabited by the same family since the 16th century. As guests of the castle you will be treated to an authentic Farm-to-Table experience, in the tradition of a Scottish Tea and Scones. Later we continue to Inverness, to check in to your quality hotel is set within four acres of manicured grounds, offering the very best in Highland hospitality. A short drive from Inverness we visit the eerie Culloden Moor where Bonnie Prince Charlie’s Jacobite army was finally crushed in 1746; we see the battlefield and discover its history in the excellent Visitor Centre and exhibition. We then pass along the shores of Loch Ness where you can keep your eyes peeled for a glimpse of the monster! Following the rugged coast-line we pass in to the scenic far northern Highlands to the fishing town of Wick where we pause at the Old Pulteney Distillery to learn about the production of the national drink and sample a wee dram ourselves. We continue to Thurso for our overnight stay. 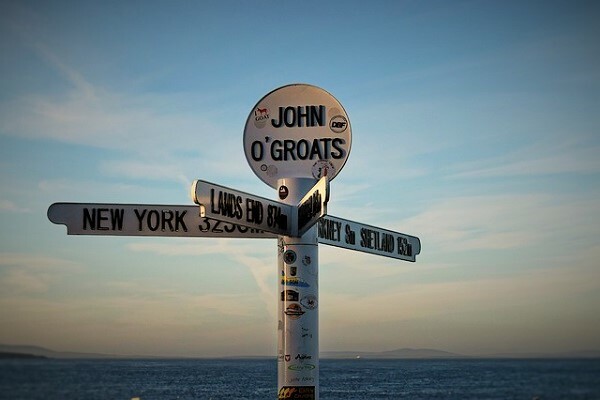 This morning, we head to the most northerly town on the British mainland, John O’Groats before boarding the ferry to the beautiful Orkney Islands. The rest of our day today is dedicated to exploring the untamed scenery and array of historic and pre-historic sites of this remote island where the hardy locals live ‘below the wind and above the water’. 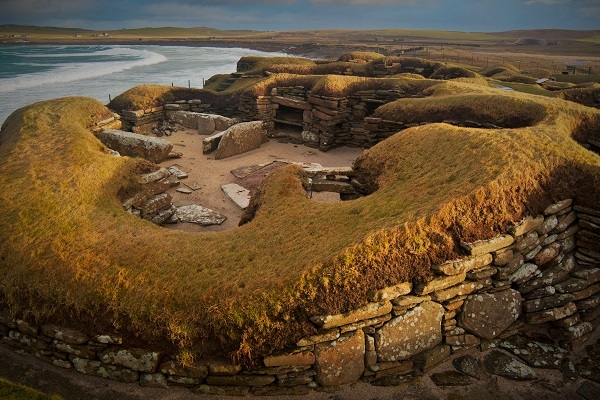 Our day of sightseeing includes visits to the 5000-year-old village of Skara Brae, the mysterious standing stones of the Ring of Brodgar, Kirkwall, the isle’s main town, and the small chapel built by Italian prisoners of war during WWII. By evening we return to the mainland and your Thurso Hotel this evening. 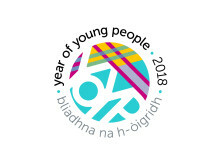 Returning south along the northern coast with its white sandy beaches, and inland through the stunning and pristine landscapes of the northern Highlands we'll see misty valleys and glens, lochs and rushing waters. 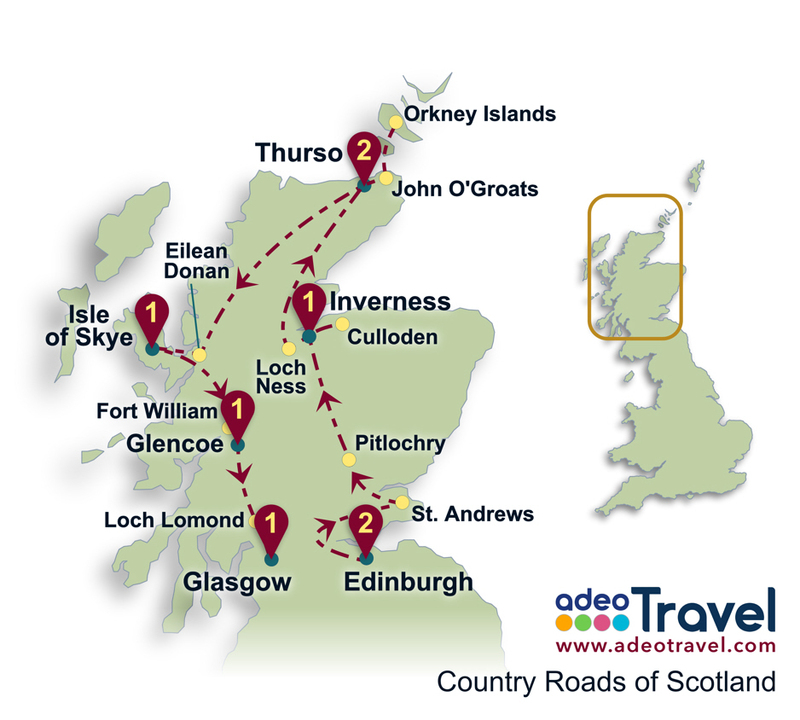 Your drive will take you along stretches of the renowned Scottish NC 500 route. Then it’s ‘Over the Sea to Skye’ the largest and most beautiful island of the Inner Hebrides. On route you’ll hear romantic tales of how young Flora MacDonald helped rescue Bonnie Prince Charlie with their escape to this remote island. This morning we enjoy a relaxed start with some time to briefly explore this wild and beautiful island before crossing Skye Bridge to the Kyle of Lochalsh. There’s the chance for a photo at remote Eilean Donan Castle, which under a clear sky offers a perfect reflection in its loch. Further south we arrive at the WWII Commando Memorial with stunning views of Ben Nevis, Britain’s highest mountain. We then continue through yet more extraordinary scenery passing through the Valley of Glencoe, its dramatic peaks still echoing with the ghastly cries of massacred clansmen. Tonight, enjoy a celebration dinner at your hotel. Continuing south, we pass through the beautiful scenery of the Scottish Highlands and along the “bonnie banks” of Loch Lomond where you'll have the opportunity to join a cruise on the chilly waters. Later we continue to Glasgow, Scotland's largest city; an orientation drive shows you the city’s grand public buildings, including the statues and city hall of George Square and St Mungo’s cathedral. Then the rest of the afternoon is at leisure to explore this thriving centre for Scottish culture, perhaps enjoy the best shopping in Scotland or visit the magnificent Kelvingrove Museum in the fashionable West End. Your tour comes to an end after checking out of your Glasgow hotel. You may choose to return to the airport for your home-ward flight (complimentary transfers available), continue to explore the city independently or make your onward travel within Scotland or South in to England. For a limited time in August, you are witness to the breathtaking spectacle of the Edinburgh Military Tattoo. Walk within the walls of Edinburgh Castle to view the Scottish Crown Jewels. Experience traditional Scottish hospitality, with an afternoon tea at Ballindalloch Castle and Gardens. Visit the site of the Battle of Culloden which changed the Highland way of life forever. Enjoy a full day on the windswept Isle of Orkney to discover its wealth of relics that span human history. Sample a wee dram at the Old Pulteney distillery produces whisky with a distinctive flavour. Enjoy a guided city tour of Edinburgh down the Royal Mile and over to the beautiful New Town. 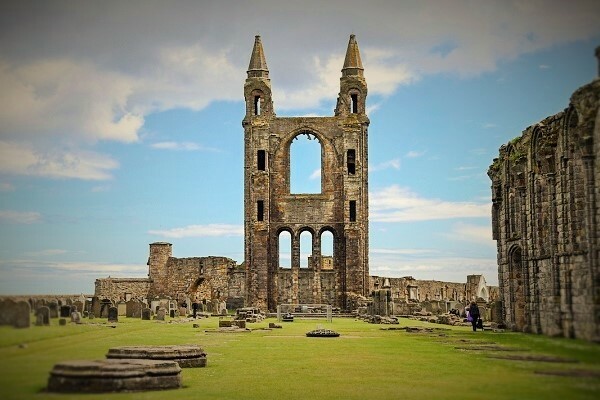 Visit the university town of St Andrews and see the golf course. Drive along the shores of Loch Ness. See the dramatic Cuillin Hills and spend a night on the Isle of Skye. 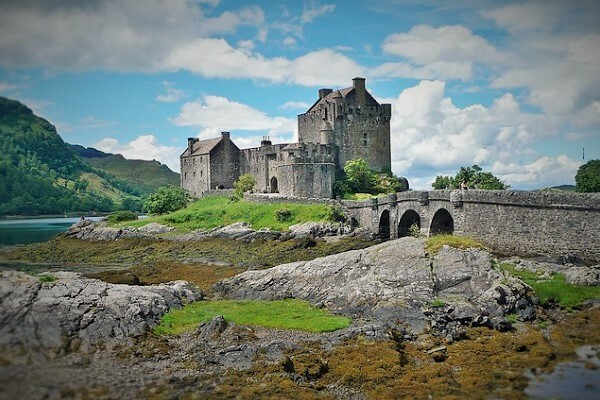 Enjoy views of the iconic loch-side Eilean Donan Castle. Enjoy an orientation drive around the bustling city of Glasgow. 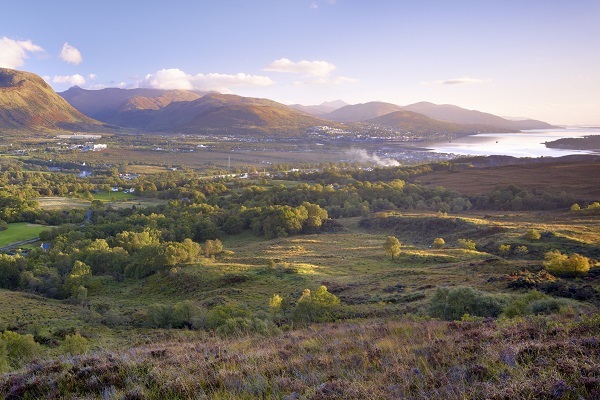 Scenic drives: Grampians, North West Highlands, Skye, Glencoe, Loch Lomond. 1 x traditional afternoon tea. 6 x evening meals as per the itinerary. The signature Kingsmills hotel in Inverness comprises of a sympathetically extended 17th century residence, presenting a seamless blend of style and substance and proud of its reputation for a warm welcome. The Highland hotels are mainly traditional and much simpler in style, although typical of the region. All quality overnight hotel accommodation, as per the tour itinerary, featuring twin rooms and private facilities. All service charges, taxes and porterage are included. Enjoy the unique comfort of a luxury air-conditioned 40 seat coach with extended leg room and on-board restroom. Free wi-fi in most hotel rooms or lobbies and available on most touring coaches. Maximum group-size of 40 passengers on board. Personal radio headsets for all guided visits allowing you to wander without missing any commentary. A travel wallet with your tour documentation. 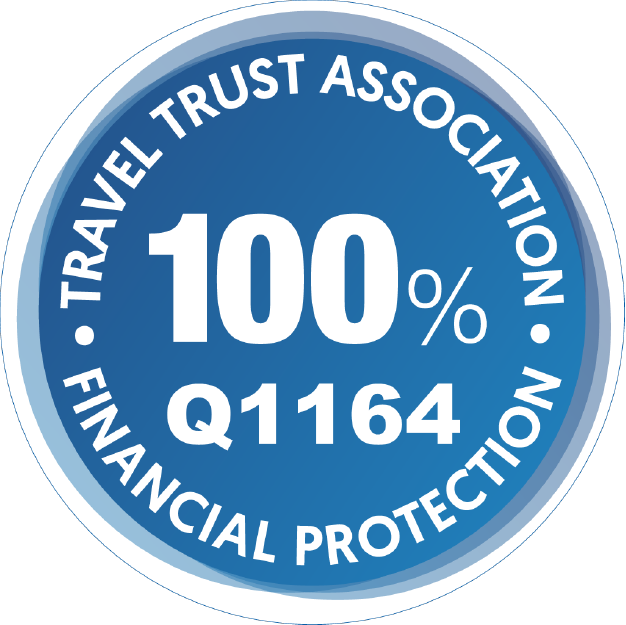 Pre or post tour hotel accommodation in Edinburgh or Glasgow. Airport transfers or transport to/from your departure/return cities. Rail transport from London or other areas of the UK to/from Edinburgh/Glasgow. Your tour already includes a comprehensive sightseeing program however some additional excursions may be available to enhance your trip further - these are fully optional and bookable during your tour. We have 2019 tour dates and pricing available and are in the process of updating our website. Please contact us with your preferred dates and we will send you a quotation.